The historic Samuel Cupples House on the campus of Saint Louis University in St. Louis, Missouri serves as a gallery for SLU's collection of fine and decorative art dating from before 1919. The Eleanor Turshin Glass Collection is shown throughout the house, which was once the home of wealthy St. Louis entrepreneur Samuel Cupples. Construction of the house and stables began in 1888 and the house was completed in 1890. Acquired by SLU in 1946 and originally known to students as the Chouteau House, the building was used as a student center — the basement once hosted a bowling alley and bar — and for academic advising, among other functions. In 1973, Maurice McNamee, S.J. took on the task of restoring the house to its original appearance. Cupples House was placed on the National Historic Register in 1976. The McNamee Gallery, located on the lowest level of Cupples House, hosts exhibitions of art by SLU students and faculty from the fine and performing arts department, as well as visiting artists. Walk-in visits to Cupples House are welcome for groups of all sizes. Cupples Hosuse will be closed Wednesday, April 10 for a private event. The house will also be closed April 19-21 in observance of Easter. Cupples House is built in built in the Romanesque Revival style. Now more than 125 years old, the house was restored beginning in 1973. Art Nouveau was an important artistic movement that represented the changing tastes and times at the turn of the century. It appeared in the beginning of the 1900s and emphasized the beauty of everyday objects; there are very few non-functional pieces. Art Nouveau rejected the classical approach to art, which stresses order, restraint and symmetry. Instead, the movement features asymmetric design, stylized interpretations of nature and organic flowing lines. Art Nouveau advanced theories advocating the role of the craftsman, artistry and individualism. Bright colors and fluid shapes are indicative of the art nouveau style. Around the 1920s, Art Nouveau gave way to Art Deco, which emphasized order, symmetry and geometric forms. 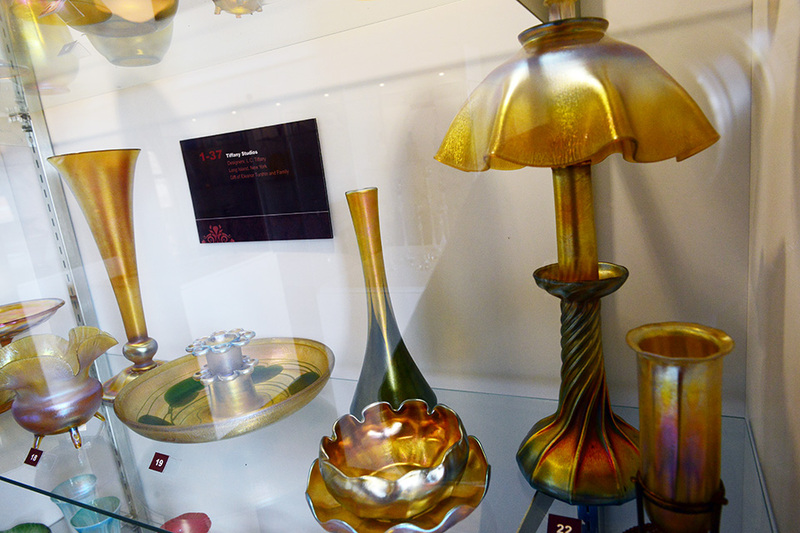 The linear, more formal pieces in the Turshin Collection are examples of Art Deco glassware.